Back in 1912, when the RMS Titanic sank, the world of photography was in its infancy, and there was no such thing as colored pictures. There were images of the Titanic, but the pictures that were taken of this amazing ship were taken with black and white film. When the tragedy struck, and the ship sank, there were pictures all around the world of what had happened and the ship itself. 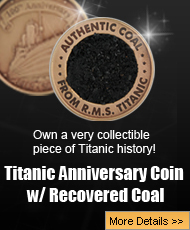 For the past 105 years, any image of the RMS Titanic that is shown on the television, has been in black white. 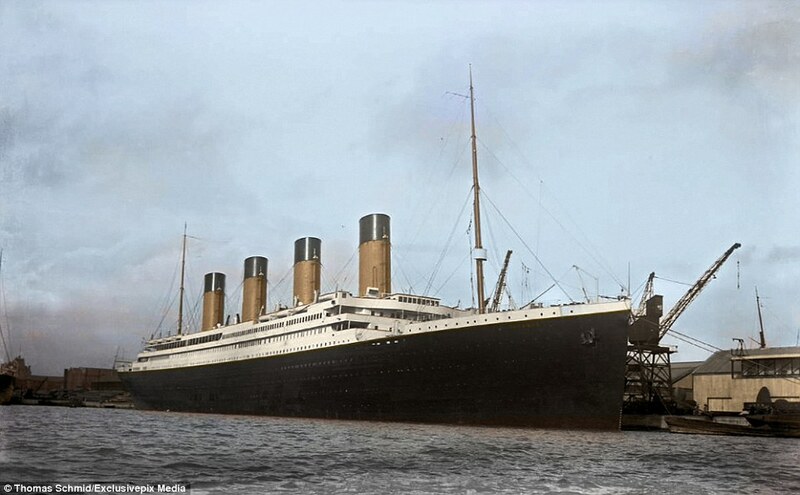 However, now, someone with the technology has finally decided to colorize the images of the ship, and the results are absolutely stunning and bring the ship back to life like never before. 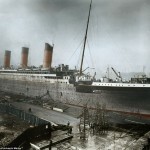 This beautiful colored image of the RMS Titanic was taken before it sailed from Southampton. The ship itself looks so much bigger and more life-like when it is in color, and this was the exact sight that the passengers saw when they climbed aboard her that April afternoon. This is a picture from when the ship was under construction in Ireland at the Harland and Wolff shipyard. 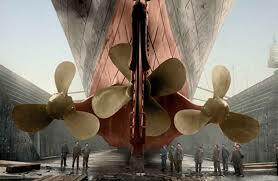 Over 15,000 Irish workers toiled day and night, pretty much non-stop, until the ship was complete. 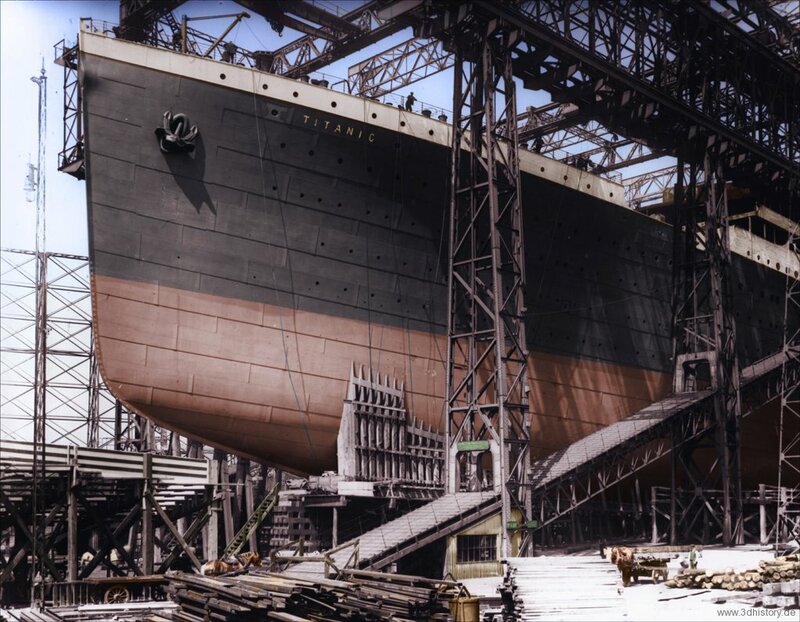 Once all the construction was done, the Titanic was launched and headed into dry dock in order to be fitted out. It only took 62 seconds for the Titanic to slide down into the water, and that was with tallow spread all over the ramp, and the ship being weighed down by chains. The launching of the Titanic was witnessed by many people, and it was actually a big event that people got invited to with special tickets. Many people that witnessed the event talked about just how big Titanic was, and the noise from her sliding into the water was quite loud. 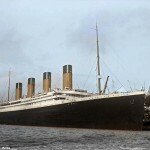 Back in 1912, when the Titanic was built and set sail from Southampton, England, there was not the same kind of social media or even regular media coverage there is today. In order to get an idea of how big the Titanic was, this picture was taken of eleven men who are looking up at the giant propellers. 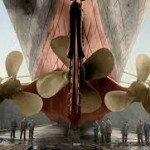 When the RMS Olympic had a collision with the HMS Hawke, she got put into dry dock. The accident was quite serious, so serious that the construction on Titanic stopped, and all the men went to the start repairing the damage to the Olympic. 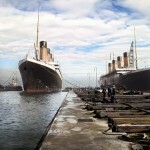 So at one point, both sisters were in dock together, and this rare image actually shows the two ships side by side. 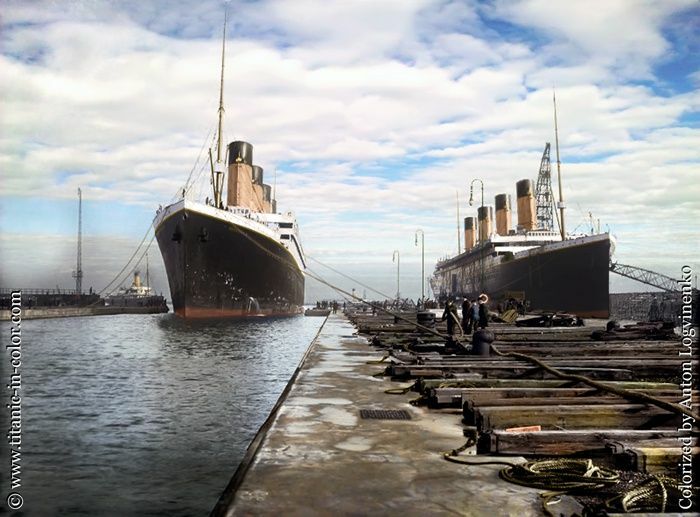 The repairs on the Olympic actually took so long that it delayed the maiden voyage of Titanic, which pushed the date to April 10, 1912. 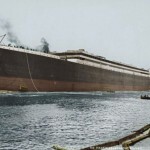 Perhaps, the fate of the Titanic would have been different if it had launched on time, which was originally some time in March. 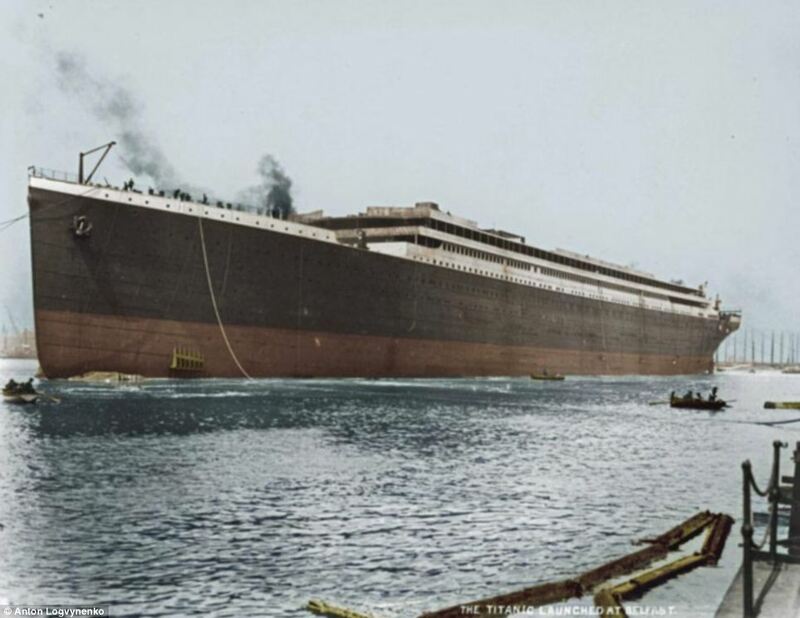 This is a rare photograph of the RMS Titanic on the day she left Southampton, England, on the 10th of April 1912. 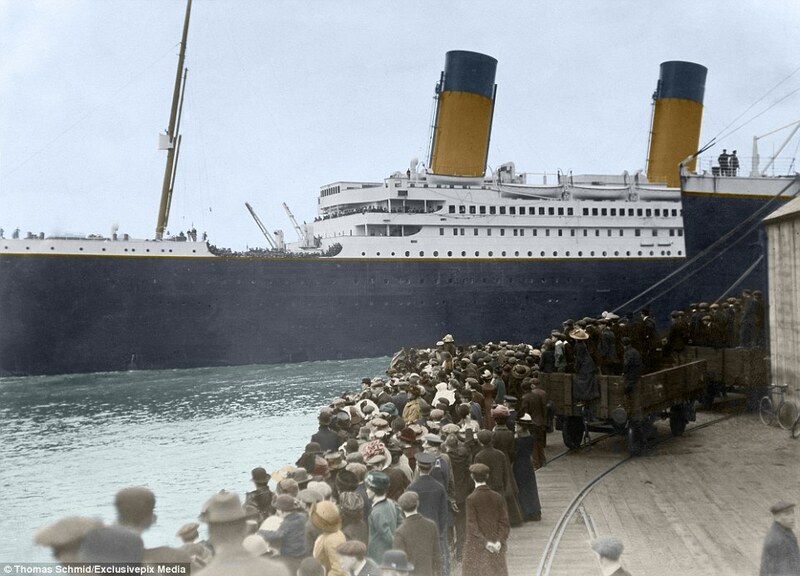 Not only does this colorized photo show the beautiful Titanic leaving Southampton harbor, but it also gives a rare glimpse into life back in 1912. This image shows the fashion that people wear, both men and women, and it is amazing how the fashion has changed in over 100 years. 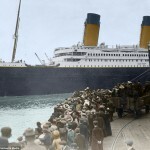 The Titanic leaving Southampton heading for New York was a worldwide event, and these people were lucky enough to have seen it, especially considering her ultimate fate. Back in 1912, when people took photographs, they were not able to take those pictures in color. Over the past 105 years, technology has changed a great deal, and people have been able to take photos in color for quite some time. Whenever the Titanic has been shown in photographs, the pictures have always been in black and white. While still stunning images, the pictures of the doomed liner in black and white were nice, but now that they have been colorized, the images are even more amazing. 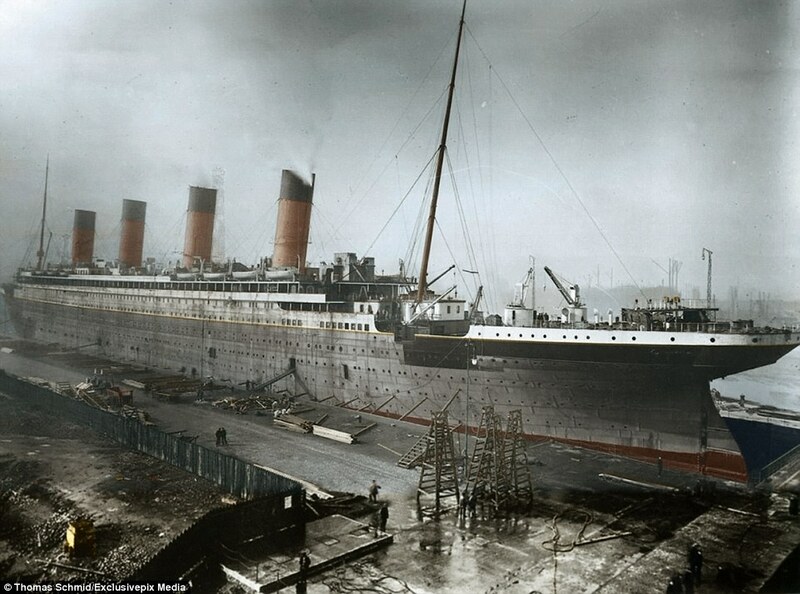 The ship under construction, and even just sitting in dock, show so much more detail now that they are in color then they ever have before, and for those that study the ship, and her tragic ending, these pictures are beautiful. 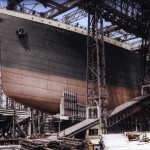 The images of the Titanic have been colorized, both the exterior of the ship while it is construction, and there were many more images of the interior of the ship, which will be posted next week. The photographs of Titanic are very rare, and seeing her interior especially, in color only make her seem more real than she ever was before, and it makes her striking the iceberg, and sinking, even more tragic.